In the SHS Implementation Planning Workshop (Batch 3) attended by SDS Socorro V. Dela Rosa, Dr. Feliza D. Dellosa, the then Division SHS Coordinator, and Mr. Ireno M Dicen, the then Division Values Education Coordinator on October 22-24, 2014 at the BP International-Makiling, Jamboree Site, Los Baños, Laguna, six schools were not included in the shortlist of secondary schools to be implementing SHS. 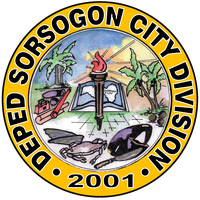 It was a great dismay that Sorsogon National High School (SNHS), the premier school in Sorsogon City, was one of them. In the shortlist, only 11 schools were included. These are: Bogña IS, Buenavista NHS, Buhatan INS, Gatbo NHS, Osiao PNHS, Pamurayan IS, Panlayaan TVHS, Rawis NHS, San Isidro NHS, Sawanga NHS, and Sto. Niño IS. Schools that were not included in the shortlist are Abuyog NHS, Buhatan NHS, Celestino G. Tabuena MNHS, Lydia D. Martinez MHS, Rizal INS, and SNHS. The school heads of these schools were disappointed because they were there in the series of activities the division had for SHS implementation. Engr. Ritchie R. Ortiz, In-Charge of Educational Facilities in the division, had site appraisal for schools that were initially found out for not having buildable space. The team who attended Batch 3 of SHS implementation workshop in Makiling said to him that they had justified and recommend solutions to turn red into blue. Through a Division Memorandum issued by the SDS Dela Rosa, a Final Decision- Making Workshop on SHS was conducted and facilitated by the Division SHS Coordinator on February 13, 2015 at the Division Library Hub, DepED-Division Office, Sorsogon City. In this workshop, each of the 17 public secondary school heads decided to turn his/her red flag schools into green. Not even one of them would like to be left behind come 2016. The conduct of the PTA summits aimed at (1) informing the public of the salient features of the K to 12 Basic Education Program (BEP); (2) explaining the reasons why we need to implement 12 years of basic education; (3) sharing to the public the parent’s point of view on SHS implementation ; and (4) allowing the stakeholders to express commitment in promoting SHS implementation. Relative to these PTA summits, Mr. Armand D. Engay, Education Program Specialist-II, Social Mobilization & Networking (SM &N) Section of the SGOD, also proposed and conducted the SHS implementation drive, with the SGOD team for all Grade 10 students in the division. The team went from one secondary school to another, amidst the risk in reaching out the far flung barrios and coastal schools. The major aim in his proposal is to guide the Grade 10 students on what track and strands to choose come SY 2016-2017. Deadline for submission of documents will be on January 26, 2015. 2 years experience in education research, dev. Click the link below to download the division memo. PROCLAMATION NO. 953: Declaring 30 January 2015 as a National Day of Mourning All public institutions and military installations in the Philippines are instructed to lower the Philippine flag to half-mast on January 30, 2015. The entire nation is requested to offer prayers for the eternal repose of the souls of the victims and for our people to reclaim our sense of humanity. DEPED CENTRAL ADVISORY: On monday, February 2, 2015, during our flag raising ceremony, let us collectively honor our 44 SAF heroes and remember all those who perished in Mamasapano, Maguindanao by observing 44 seconds of silence plus one more second for all other casualties. We pray that the path to peace does not lead to the loss of more lives. May our schools continue to foster understanding and tolerance for the healing of our nation.